Back in January, Patagonia paid me to go to Chile for two weeks to volunteer with ForestEthics, a North American-based environmental group working to preserve and protect native forest. My name is Jim Little. I’m an editor here at Patagonia, and one of 21 employees last year who took advantage of one of the coolest programs this company offers. 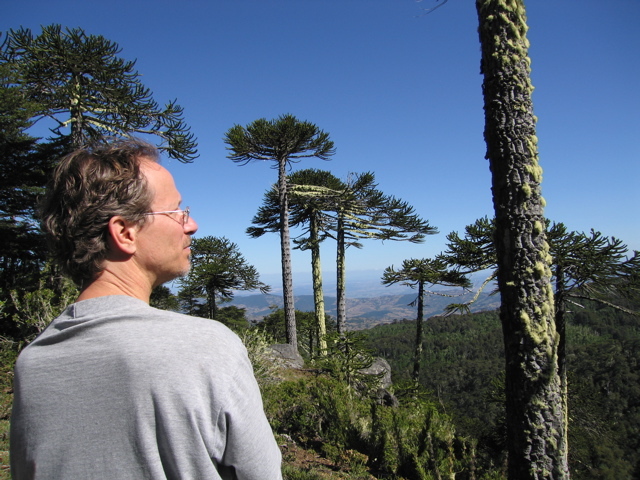 My goal was to help ForestEthics advance the story of its work in Chile. The actual result of my internship turned out to be different, but perhaps even more helpful in the greater scheme of things. If you’re interested in Chile and its amazing landscapes, read on to hear about my experience. If not, no problema. My flight into Temuco, capital of Chile’s Region IX, gave me a bird’s-eye view of the issue. From the air, the forest clearcuts bordered by neat rows of Monterey pine and Douglas fir – plantation tress – were very clear. Chile, I would come to find out, contains one-quarter of the world’s remaining temperate rainforests with the highest biodiversity among temperate forests worldwide. More than 90% of the animal and plant life is endemic. But many of the species of plants, mammals, birds, fish and insects in this area are threatened or endangered. Continued cutting of native forest will drive many of them to extinction. Aaron Sanger, my ForestEthics contact and host in Chile, was working to make sure this didn’t happen. Aaron had moved with his family from Corvallis, Oregon, to Villarica, a year before my arrival. He’d relocated to try to implement the specifics of memorandum of understanding ForestEthics (FE) had wrested from Arauco and CMPC, Chile’s largest forest companies. The companies’ practices have led to systematic clearing of native forest since the 1970s – some of it is globally rare and known only in this region of south central Chile. The government paid the companies 70-90% of the costs of replanting their cleared land with trees suited for export. Now, some 30 years after the government incentive program began, Chile’s forest products earn the country a sizable chunk of foreign exchange. As a result, the country’s 15 million hectares (37 million acres) of forested land now includes some 2.2 million hectares (5.4 million acres) of non-native trees. 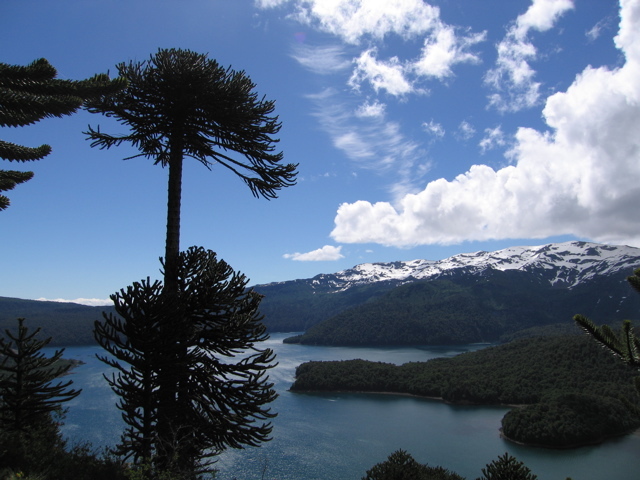 Stands of araucaria, or monkey puzzle, which is Chile’s national tree, have been mowed down along with roble, lingue and other natives. 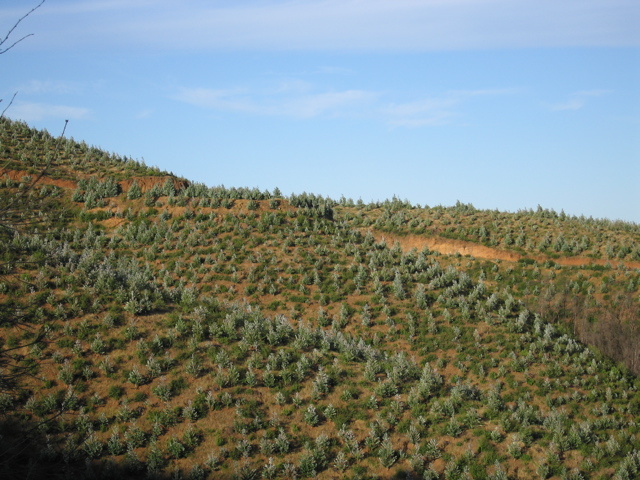 Monterey pine, eucalyptus, Douglas fir and other foreign species now grow in their stead. For animals living in the forest, a tree isn’t just a tree. Substituting non-natives for natives has destroyed their habitat and diminished Chile’s biodiversity. The clearcuts have also left huge scars on the landscape. When it rains, which it does hard in this area, the runoff carries with it thick layers of topsoil that chokes streams. The big trees of ancient forests also do much to absorb carbon dioxide and produce oxygen. In these parts they’re typically cut for firewood, which is used to heat homes. Native trees are then replaced with fast-growing seedlings to be harvested 10-20 years hence for use as moulding, windows, doors, pallets and pulp. The wholesale destruction of Chile’s forests prompted ForestEthics to fire up a market campaign in the U.S. that began in 2000. Its purpose was to stigmatize the use of Chilean forest products in the U.S. so people wouldn’t buy them. It did this by linking the production of Chilean wood with the widespread environmental destruction it caused. A full-page ad in the NY Times showing an American “dream house” in the middle of a Chilean clearcut made the connection graphically clear. 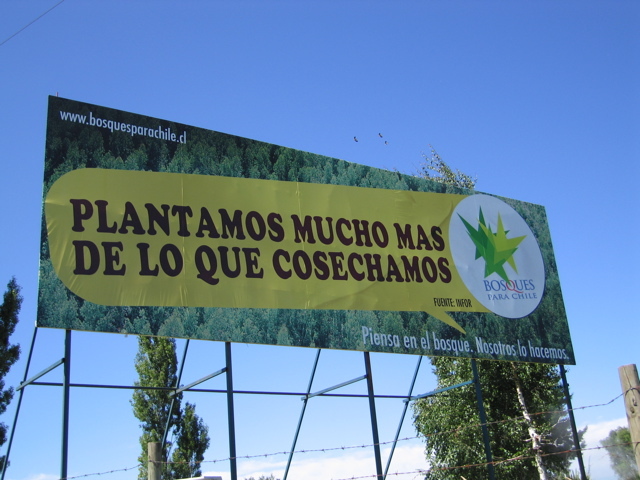 The campaign took several years, but it succeeded in convincing American companies not to buy Chilean wood unless it was certified by the Forest Stewardship Council, which requires better forest management. 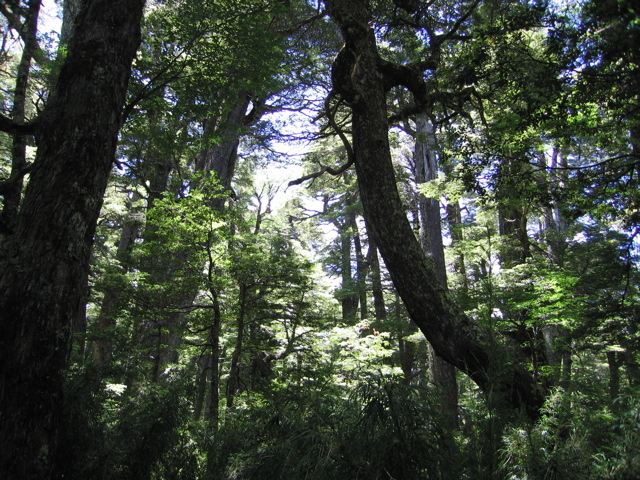 The financial loss to Chile’s forest companies was significant. 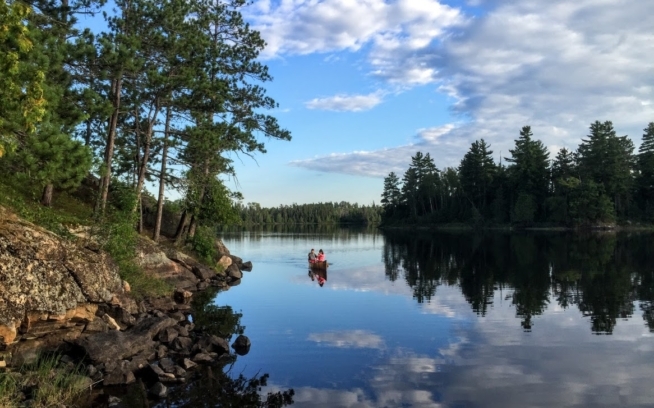 Rather than lose the U.S. market forever, the companies agreed to work with FE to develop a plan that would do a better job of preserving native forest and the species that depend on them. I spent a lot of time with Aaron learning this story. We visited dense stands of native forests and tidy tree farms. We met with forest engineers and forest activists. We chatted at length about forest issues and social issues. Aaron explained how the indigenous Mapuche had lost their native lands to the forest companies under the Pinochet dictatorship, and how industrial forestry resulted in fewer jobs and lower wages. We discussed the next round of financial incentives from the government, which aim to double the acreage of plantation forests by encouraging small landowners, who own even more land than the big forest companies, to cut their trees and replant with non-natives. I also got a chance to explore Region IX, which has amazing national parks, hot springs, forests, rivers and lakes. 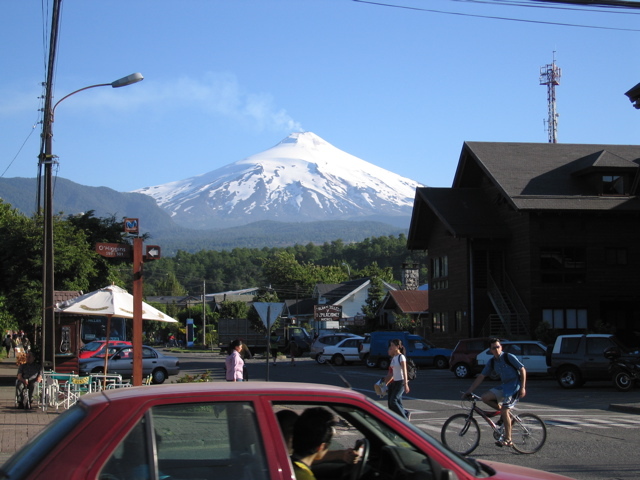 I slogged to the summit of Volcan Villarica, breathed its sulfuric emanations and glissaded down its snowy flanks. I soaked in water heated deep in the earth, ate way too many empanadas and sipped an equal amount of carminere. People from all over the world come to Auracania to do the same. I have to confess I hadn’t spent a lot of time thinking about forests before this trip to Chile, though I’ve always enjoyed being in them. And this is one of the great things about Patagonia’s enviro internship program. It not only gets us away from our desks to do something bigger picture, it allows us to familiarize ourselves with issues we may know little about. When I returned to California, the information I gleaned in Chile did much to inform a seemingly unrelated project: our newly minted Patagonia Paper Use and Procurement Policy. As you’re probably aware, millions of tons of trees are cut each year and pulped to make paper. So using even a small amount of recycled paper in the endless stream of publications that turn up on newsstands and in mailboxes goes far to save forests. Patagonia does a really good job of using paper with recycled content, particularly in our catalogs. But we’d never formalized our goals and practices. I was able to help put in writing what has to be one of the most environmentally progressive paper policies around. We’re very proud of it here at Patagonia, and hope it serves as a model for what other companies can do, should they also choose to demonstrate their concern for the natural world. Aaron and his family are now back in the U.S., where Aaron has taken a new job focused in Chile. 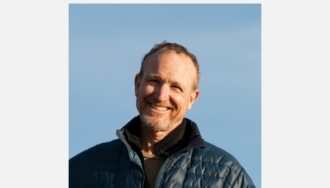 Working with International Rivers, he’ll lead the Patagonia Campaign against plans to build three dams on the Pascua River and two dams on the Baker River in Chilean Patagonia. The Baker and Pascua are two of Chile’s most powerful and pristine rivers. They run through a mostly undeveloped backcountry of rivers, glaciers, snowcapped volcanoes, and temperate rainforests – one of the most compelling ecotourism destinations on earth. But a consortium of huge companies from Chile, Spain and Canada want to begin “developing” Chile’s Patagonia by damming the Baker and Pascua to generate electricity that would be sent thousands of kilometers north to serve Chile’s biggest cities and copper industry. The dams would harm Patagonian communities by creating artificial lakes on its best ranching and agricultural lands. Reservoirs created by the dams would destroy large areas of temperate rainforest, including the habitat of the critically endangered huemul deer, a Chilean national symbol. And getting the electricity to its intended markets will require a more than 2,000 kilometer long corridor for transmission lines, much of which would be clearcut through virgin rainforest. 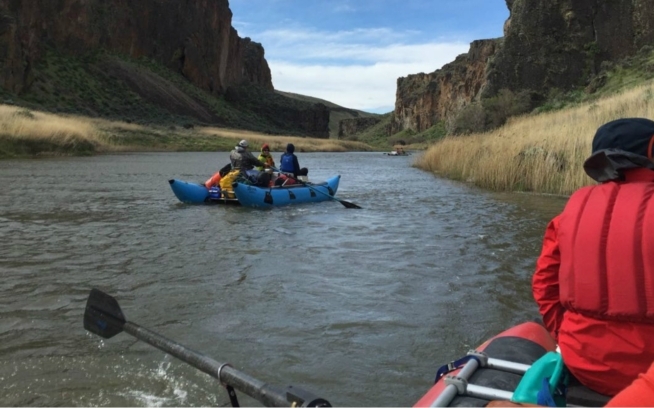 If you would like to help with the Patagonia Campaign, contact Aaron at aaron@internationalrivers.org.